Immerse yourself in the mesmerising landscapes of Chile’s Lake District on this 6-hour tour from Puerto Varas, including hotel pick-up. 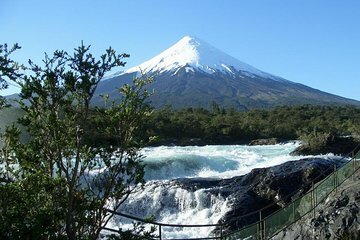 Enjoy views of Lake Llanquihue, Laguna Verde and Osorno volcano; sample smoked salmon from the Pescado River and browse for handicrafts in Ensenada village. After lunch at a local restaurant (not included), head to the Vicente Perez Rosales National Park, where you can hike through the forest, visit Petrohuè Falls or cruise the Todos Los Santos lake (extra costs apply). Centrally located Puerto Varas hotels.